but i am not getting why these people forget that n0kia n9 is one of its kind in terms technology and innovation. and i urge people how dont like nokia to swipe off from this page. Anonymous, 22 Jun 2011Does anybody know the price range of this unit in dollars when it becomes available?The Nokia N9 will retail at $660 and $749 for the 16GB and 64GB models respectively. When will the review be posted? If you have a dual core you wil find the battery dies faster. What you should think is not how fast is the CPU but how fast does it run. Obviously, If you put a faster PCU it will run faster, but that is not neccesary if you have a good software running. You can put a truck motor on a car, obviosly it will have more power. But how much gas(battery) it will need. 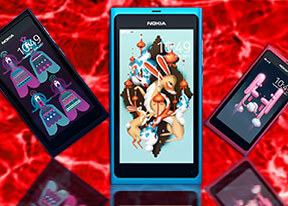 The technology and multimedia isn't question for Nokia. but, what about battery performance? And about swipe. Don't you think 'swipe to go home' won't confuse the software when we wanna scroll the pages? I'm afraid it would be an issue. and the screen looks like a Symbian. But it's MeeGo. The Icons really looks like new Symbian icons. I have heard that the price of N9 will be around 666$ for 16gb and around 777$ for 64gb model. Why can't they use xenon flash instead of the cheap LED lights, the results from a xenon flash is much better than as compared to LED flash. 677 US $ for this phone? Is Nokia making sure this won't take off? That's too much for a single core phone that might be the last of its kind in Nokia's lineup. As if we all are sticking our ears to radio instead of some pumped up music. This is perfect, i'd say. Though the exmor r would have been better other than plain c-mos. Any way every way all the way n9.